On October 8, 2016, ACHA members in New York met to discuss strategies for women’s empowerment, education and awareness around domestic violence and gender-based violence. The retreat was facilitated by ACHA co-founder, Dechen Tsering, from the Berkeley, CA and attended by ACHA Advisors, Losang Rabgey, Tashi Chodron, and Sangmo Thar. 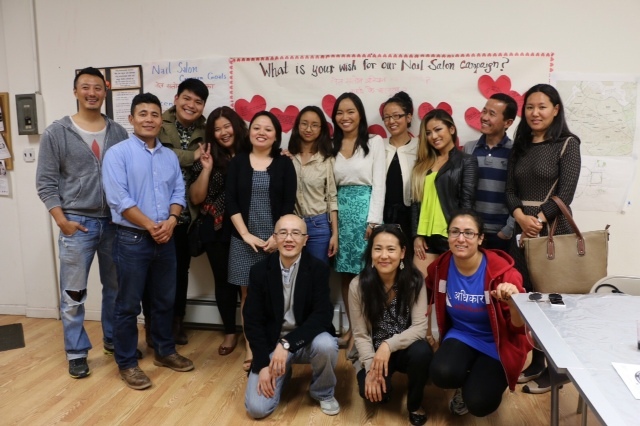 May 2nd, 2015, ACHA collaborated with Tibetan Community of New York and New Jersey and Global Tibetan Professional Network to bring Himalayan Students’ College Day. 80+ high school students of Himalayan heritage attended the event. 30+ junior and four year colleges were represented. 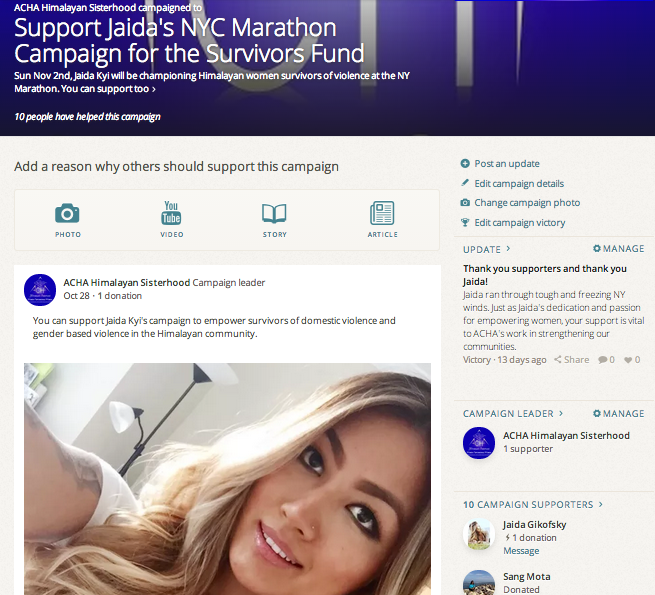 This year, ACHA NY member Jaida Kyi ran through 26.2 miles of tough freezing wind to champion the Survivor Fund Project, which supports survivors of domestic violence and gender-based violence in the Himalayan community. She raised $650. Jaida and her mother, Sang Mota, both are active members and supporters of ACHA Himalayan Sisterhood chapter in New York. ACHA Himalayan Sisterhood initiated the Survivors Fund for survivors of all forms of gender-based violence. ACHA offers safe and confidential support through compassionate listening, multi-lingual counseling, and connections to resources to help survivors fight for justice and rebuild their lives. Financial support to ACHA’s Survivor Fund directly supports case management to three Tibetan survivors of domestic violence in the U.S.. Three ACHA members are trained Domestic Violence counselors and collectively offer services in 3 major Tibetan dialects i.e. Central dialect (Lhasa), Amdo dialect and understand Kham and in other Asian languages i.e. Chinese (Mandarin), Nepali and Hindi. ACHA advocates for policy changes in the Himalayan leadership toward gender-based violence through publications to raise and mobilize public awareness. 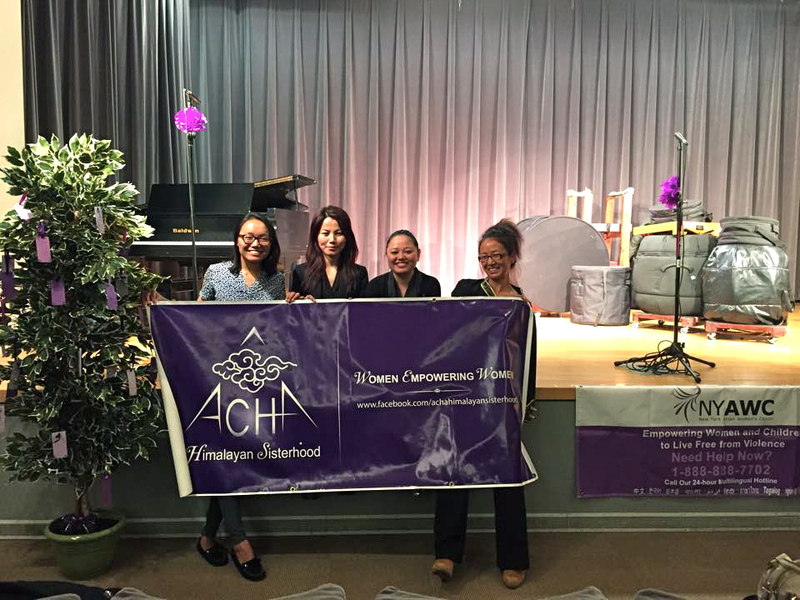 To commemorate the National Domestic Violence Awareness and Prevention Month 2014, ACHA partnered with New York Asian Women’s Center (NYAWC), to host a very special event to honor the strength and courage of survivors and their children. Our very own ACHA NY member/ Cholsum Dance Troupe member – Namgyal Norbu performed a traditional Tibetan song. ACHA NY partnered with Adhikaar, a New York based non-profit organization working with Nepali-speaking communities to promote human rights and justice for all, for a domestic violence workshop for the Himalayan community. Educating our community on steps to take and resources to reach out to so that we can collectively end violence in our families and broader community.